The Poroshell 120 4µm columns greatly expand the Poroshell 120 family, providing scalable solutions for chromatographers and method developers. The robust 4 μm columns deliver easy drop-in method replacement, with column backpressures half that of Poroshell 120, 2.7 μm and efficiencies nearly double those of traditional, totally porous 5 μm columns. If you want moderate performance increase, simply bring Poroshell 120, 4 μm columns into your method. With its exceptional flexibility, the Poroshell 120 EC-C18, 4 μm, also offers the best place to start your method development. 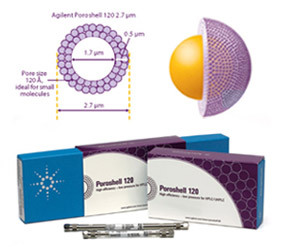 However, if you are working with challenging analytes, the Poroshell 120 family has many other chemistries. 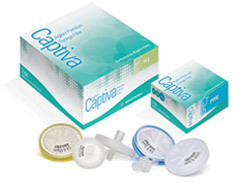 Purchase eligible Captiva Syringe Filters and receive 20% (1000-1999 filters), 25% (2000-2999 filters) or 30% (3000+ filters) off list price. Purchase eligible Bond Elut Quechers or bond Elut SPE and receive a 30% promotional discount. For years, Agilent has understood that filtering samples prior to HPLC, UHPLC, GC/MS, and LC/MS analysis can improve both system performance and analytical quality – and this experience is reflected in our new line of Captiva syringe filters. Choose from a variety of membrane types, pore sizes and formats to suit your needs. Use the Agilent Syringe Filter Online Selection Guide to find the right filter for you. Agilent Captiva Premium Syringe Filters make the process faster than ever with the industry’s highest flow rates and loading capacities. In addition, Agilent sets the standard for LC/MS testing and certifying more syringe filters to be completely free of observed extractables than any other manufacturer. All Agilent Captiva Premium Syringe Filters are supplied with a HPLC or LC/MS Certificate. Buy Agilent Captiva Premium Syringe filters. Agilent Captiva Econofilters - High-quality Econofilters are shipped in large packs and are ideal for busy labs that need fast, efficient filtration at a reasonable price. Buy Agilent Captiva Econofilters.